A couple of days ago I was sitting in a doctor's waiting area, glancing through the magazines which were laying on what once upon a time was a decent coffee table. As I quite restlessly scrolled the pages I suddenly saw a picture that made me sit up in the chair. A couple of guys were riding their singlespeed bikes on a court with special mallets in their hand, chasing a small ball. This sport or whatever you will call it, looks fun and it involves bikes. A friend of mine said it was sport for those fat people who didn't cope with indoor hockey. Instead of nicking the magazine, that's so 2005 by the way, I took pictures with my iPhone to store the key names for my own research later. According to wikipedia the sport origins to the Seattle area in the early 2000s. Some states that the founders was sick and tired of polo and the poshiness, therefor starting their own sport as a symbol of working class sport. Cycling has for ever been seen as a working class sport, so maybe there is truth in that. But further research indicates that the sport actually is very old. The information regarding Seattle could be true. The problem is that the sport has many names, and there are actually several different sports. Cycle polo was invented in Ireland 1891 by an Irish named Richard Mecredy, 6 players on a team but only 4 are allowed on the grass at the same time. Yup, you read it correctly, grass. Cycle polo has more rules than ie hardcourt bike polo which, as I understand it, is played on a smaller space, less rules and typically seen in backyards, basketball courts and parking lots in cities. In hardcourt bike polo, there are 3 players on each team and no substitutions allowed. A competing story says that bikes were sent to a powerful ruler in India, where the stable boys picked up what the rulers did on the polo court, transferring it to the bikes. British soldiers stationed in India brought the game back. The New York Times did an great article on hardcourt bike polo in 2007, with some pics here. I've also seen references to Urban bike polo, so there are different names out there, urban bike polo is similar to hardcourt bike polo if I have got it correctly. Rules of the game is actually not specified and they varies, but appareantly rules vary from city to city and the players work this out prior to the game. If you're playing cycle polo, there's one set of rules, when you're plying hardcourt bike polo another set. One of the rules is always present no matter where you are; it is forbidden to touch the ground at any time. If that happens, the rider should notify his/her team and move to a designated area, perform a tap-out, before allowed into the game again. Bike culture has changed bike polo from being cycle polo to hardcourt bike polo. Much of this can be traced to the bike-messenger culture which expanded heavily in the early 2000s. From bikes to clothing, the informal style and relaxed atmosphere, at least until the game is on, have it's roots to this culture. According to the magazine I read, bike polo is being played in 265 cities in 35 countries and counting. They have a league as well, the League of Bike Polo, and the Worlds is being hosted every year. Of course bike polo enthusiasts are on twitter as well, @bikepolo has currently 1020 followers. Location of clubs world wide - from League of Bike Polo website- note the club in Tromsø, Norway - way up north!. Basicly what you need is a bike and a mallet. Some use helmet and leg protection as well. As mentioned, many bike messengers, bike-shop employees and other enthusiasts are involved in this sport. They usually use fixed-gear bikes or singlespeed while working, so this is what they use on the court as well. Fixed-gear bikes is mostly used, because you can pedal both ways, something that makes you a more versatile player. 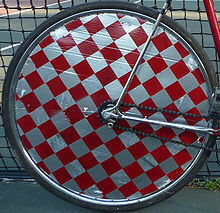 In order to protect their spokes, or for PR-reasons, some tend to place wheel covers on the wheels. You'll need a mallet, sometimes of tree, but on the urban playground they tend to break. Go for an old metal pipe you can shape into a mallet. The enthusiasts make their own mallets based on the DIY ethic, but nowadays you can easily buy one too. Often the bikes need to be customized, when performing a proper swing, the handlebars could be in the way so often people make them shorter. I don't think you'll need to be a mechanic iot play, I'm sure help will be provided if needed. My friend who ment this is a sport for those too lazty to play indoor hockey will have to eat his words. The people who are into this sport have some impressingly good handling skills on the bike and some serious coordination ability. I'm going to show him this video and maybe trick him into trying. Better take it slow in the beginning, I can picture myself in the tarmac a couple of times. What are you waiting for? Get out in the backyard and practise.